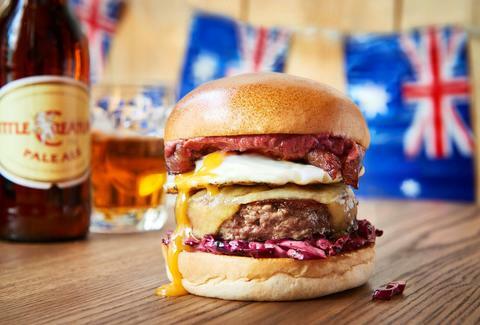 Given London’s obsession with American edibles, it’s no surprise that there’s been an explosion of burger joints popping up like weeds all around the capitol. The surprisingly delicate art of the burger is not something to be trifled with, however, so we went through and tested them all out… just to make sure you’re putting the best one in your mouth at all times, of course. 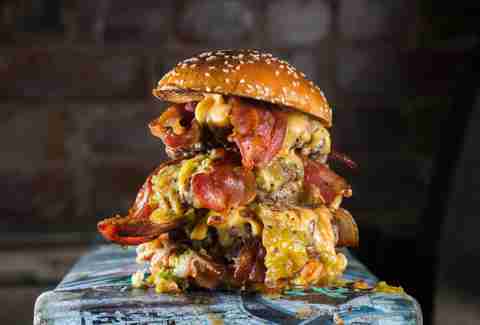 One of the original champions of burgers in London, these guys still kill it when it comes to in-your-face taste. The classic burger, made from 100% Ginger Pig ground beef, comes loaded with smoked bacon, mature cheddar, relish, and salad, and it’s everything you want a burger to be. These guys don’t rest on their laurels, however, and mix it up with outstanding monthly specials. Also be sure to grab a side of the Rosemary fries… addictive is an understatement. What started as a small food truck has transformed into a mini empire that’s earned a slew of awards. 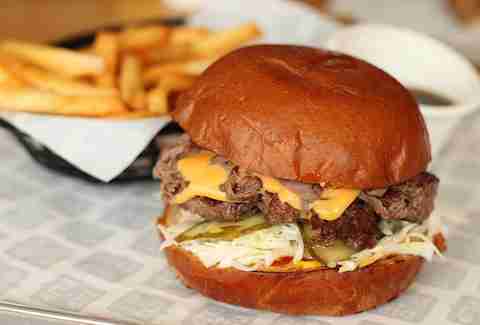 The darling of the burger scene (yeah, that’s a thing), it's now going on three brick & mortar spots, and its truck, Shirley, still makes the rounds to ensure that you’re never far away from delicious, delicious red meat. Using British ingredients whenever possible, all of the options are great, but the house classic, the Ari Gold, is the best place to start: a perfect combo of ketchup and smoked mayo slathered on a fresh brioche bun, with cheese and salad thrown in for good measure. While each of the MEATetc locations have their own special menu, the Dead Hippie -- the mustard-fried, double-pattied pile of juicy red meat -- is almost always available, and has earned itself a borderline cult following… which explains why this joint has transformed from a MEATwagon on the South Bank to an international restaurant group. Offering more than just burgers, it's got a pretty expansive menu across the board... meaning you have an excuse to visit them all. When you only have two things on the menu (well, three, if you count the lobster roll as its own separate item), it only stands to reason that everything served should be absolutely brilliant. 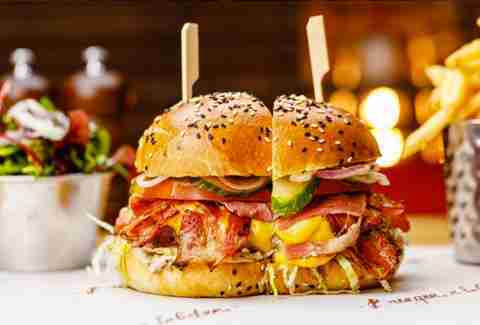 Luckily, the burger B&L offers stands up to the challenge, and is actually worth the £20 you’ll be slapping down for it. Using 100% Nebraskan beef, it boasts a ton of natural flavour, which soaks into the freshly baked buns... and will soon disappear into your eagerly awaiting mouth. If a burger and a french dip sandwich had a lovechild, the result would be the Dip & Flip Burger. A top-notch burger in it’s own right, it's slathered in special cheese sauce, loaded up with thinly sliced roast beef or lamb, and served with a small bowl of gravy to dab, dip, or simply pour over the whole thing. Grab a roll of paper towels; you’re gonna need it. 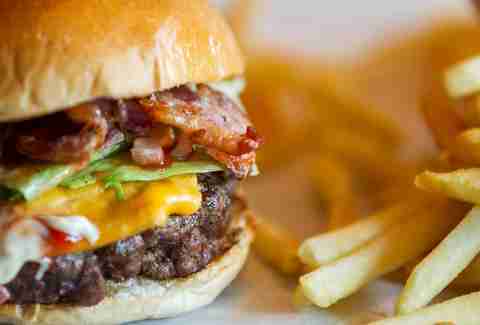 If you view the burger as a starting point from which you can build something truly momentous, Tommi’s is about to become your new playground. Its classic base is great, but we highly recommend upgrading to the steak burger, and from there, loading on up with cheese, bacon, bearnaise, the works. Also keep an eye out for the ridiculous monthly specials. This spot started out as a food truck, made by an American gal who craved the burgers she loved in NYC, but now it's branched out to a little semi-permanent stall in Old Spitalfields Market. 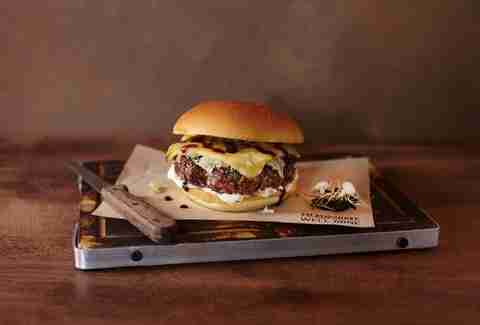 These burgers are full-flavoured patties made from beef that’s been dry-aged from 40-50 days over at The Butchery in Bermondsey, then covered in special sauce and classic American cheese. No nonsense, and totally delicious. Two words for you: bacon jam. 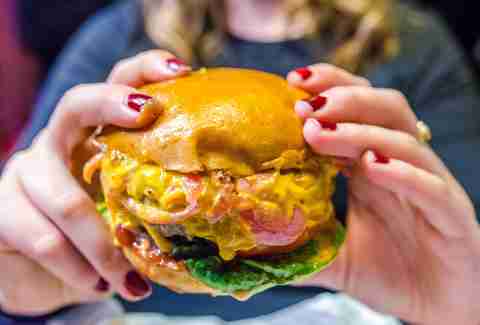 Earning a name for itself at markets led to a crowdfunding campaign for Stokey Bears, which soon led to a solid location where you can stuff your face with huge burgers dripping with delicious juices, cheese, and the aforementioned, habit-forming bacon jam. If you don’t feel up to journeying all the way east, they’ve still got a truck over at The Magic Roundabout in Old Street, where you can sit under the stars and eat in bliss. These guys have been doing residencies for what seems like forever, taking their tasty two-handers anywhere people are happy to stuff their faces. After taking over kitchens from Netil Market to Islington to Soho and more, Lucky Chip currently has a satellite over at The Queen's Head, and finally opened a spot in Dalston, with an expanded menu -- and over 100 wines that pair with classics like the Kevin Bacon (a bacon cheeseburger, obviously) or the El Chappo, which comes with bacon, blue cheese, and roasted jalapenos. 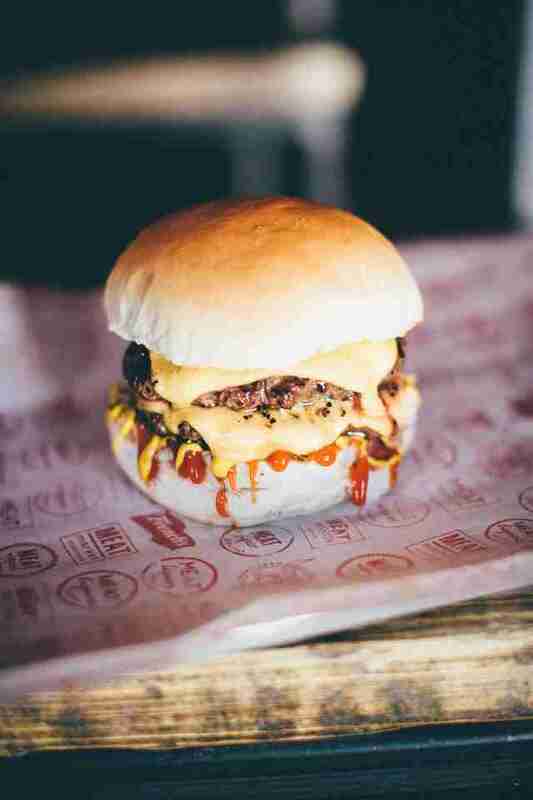 The most underrated of the burger champions, these guys have been quietly making people succumb to food comas in South London for a while... before the secret got out and they were branched out up northwest. It’s a bit of a trek from central to any of its locations, but when you’re getting intimately involved with the likes of the Truffle Shuffle -- loaded with Gruyère cheese, truffle mayo, and a honey & onion glaze -- you’ll feel it was totally worth the journey. Welcome to the land where there is no such thing as too much. 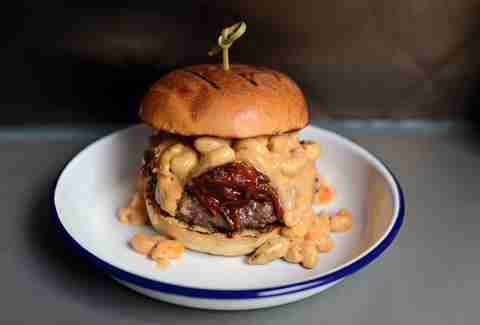 Want some mac & cheese with your burger? Then why not just whack it on the thing? The Mac Daddy is the very definition of bad for the heart, good for the soul, with a 6oz beef patty topped with pulled pork, a generous portion of mac & cheese, and a big dollop of the special Dirty Bones sauce. Haley Forest is a food & drinks writer who believes a good burger can bring you to a special level of nirvana. Follow her adventures at @HCForest.